ETPsports fabricates running track covers designed to allow access inside your running track while protecting the tracks surface for runners. Otherwise wear marks from people crossing the track could make areas of the track uneven. 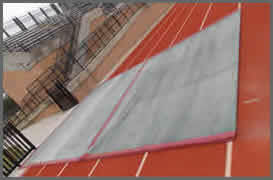 The ETP Sports track cover is great for athletic fields with surrounding running tracks. In time, teams crossing onto the field can wear out the track. Repairing sections of a track can be a costly endeavor, so your best bet is to prevent any damage before it happens. The center of the track cover has the toughest polypropylene geo-textile material that resists and cushions against steel tipped cleats, shoes, and even grounds equipment wheels, yet allows rain to drain through. Its entire perimeter edge is wrapped in vinyl with a galvanized steel chain inserted all around.